The Crooked River Roundup Board made some changes to its 2018 rodeo in hopes of enhancing the experience for the contestants and the fans. The Columbia River Circuit (CRC) Board took notice, honoring the local event as the Medium Rodeo of the Year. Board members will be officially honored at the CRC Finals in Yakima, Washington, Jan. 11-13. The recognition is a first for the Crooked River Roundup, at least according to all of the old-timers and long-time Roundup board members that Roundup Board President Jason Snider has talked to, including Doug Smith, who has served for close to 40 years. In a post on the Crooked River Roundup's Facebook page, rodeo leaders thanked a long list of people, including volunteers, board members, farmers, livestock workers, gate pullers, banner hangers, vendor coordinators, ticket takes and drink pourers. "For us, it is a huge acknowledgment of the amount of work and effort put in by the board of directors and the sponsors," Snider said. He added that the award also recognizes the relationships that are being created and fostered that allow Roundup leaders to put on the rodeo as a community. "It's a great look at what the community is doing," he said. "We couldn't do it by ourselves. It takes many to make that happen." The Crooked River Roundup was one of many rodeos nominated by the CRC Board. Rodeos are categorized as either small, medium or large based upon their added money per event. Medium rodeos have an added money per event between $5,001 and $10,000 a year. Though Snider is not 100 percent sure, he is pretty confident that the Crooked River Roundup was nominated by Blake Knolls, an event representative on the CRC board and the local rodeo's steer wrestling champion last year. "His recommendation was just to acknowledge the amount of change and the amount of effort put in the last couple of years to add unique flavors to our rodeo that caught the attention of the contestants," Snider said. "A lot of it has to do with what we bring as a rodeo to the contestants." The Roundup Board made several changes to the rodeo this year, one of which was a longer chute for timed events. "It is going to be a little more Western in the sense that there is going to be a fair amount more horsemanship, requiring these guys to chase these cattle a little further," Snider said in advance of the rodeo. "It is better on the cattle, it is better on the horses, and it makes it pretty even for all of the contestants to have an opportunity at that money." Also, a new entry was built at the north end of the arena for barrel racers. 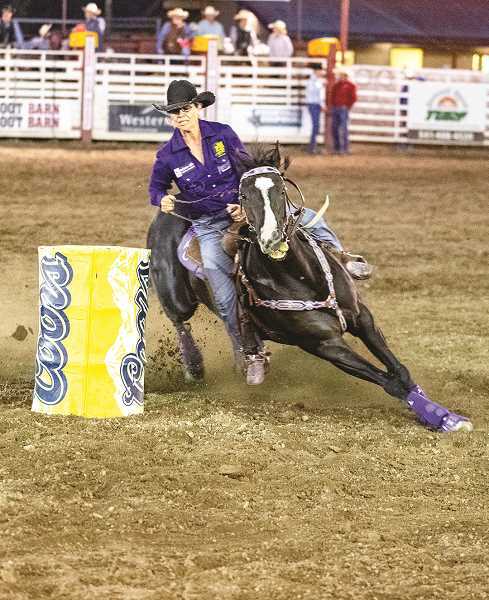 "They come riding into the arena at a dead run," Snider said about the change this past June, "so look for times to be faster and look for barrel racing to be a little more 'wow' because these girls are going to be moving much faster over the length of that arena." Wild cow milking was also added to the lineup this year, an event Snider likened to a Calgary-style setup with 10 cows and 10 amateur two-man teams in a free-for-all. "The cow gets roped and the mugger takes hold and gets the cow milked," he explained. "They have to run to a spot with at least a verifiable drop in order to get a time." Snider points out that there are 32 rodeos in the Columbia River Circuit, and Roundup leaders are pleased that their fine-tuning of the rodeo has resulted in the Crooked River Roundup being one of three recognized. "It is a great honor," Snider said.